Let me start right off by saying that Moon Knight is one of my favorite characters. Next to Spider-Man, he’s one of my favorites. My first look at Moon Knight was in Amazing Spider-Man #353, in a story arc called Round Robin. I loved it. It had Darkhawk, Nova, Night Thrasher, The Punisher, and of course, Moon Knight. It was a great story that spanned six issues and was a great introduction for me to Moon Knight. I would catch him in various issues from time to time, but it wasn’t until much later (during the issues of Vol. 3) that I really got into his story and, quite frankly, what made him the character he was. I decided to take it back as far back as I could afford, and started with this issue I’m reviewing today. Marc Spector is the second in command for a mercenary squad run by Bushman, a ruthless and bloodthirsty gun-for-hire. Bushman and Spector see very differently on how things should be done, but when Spector figures out that Bushman plans to raid a nearby village simply for the possibility of treasure, Marc decides that he’s had enough. When the raid takes place, a scientist and his daughter are trying to escape, Bushman kills the scientist. Marc sees this, but when Bushman guns down innocent civilians, Spector attempts to take out Bushman, but with not success. Bushman then takes Spector to the middle of the desert were he’s left for dead. So begins Marc Spector’s trek to become Moon Knight. To be quite honest, I was really looking forward to this being something gritty, but it had nowhere near that feel to me. Doug Moench’s writing style just did not win me over at all. It was very dry and nearly all characters felt two demensional. The story was great, don’t get me wrong, but the way that it was written out just grab my attention. Maybe it’s because of the comics code, who knows, but what I do know is that I was very dissapointed after reading this. As for the art, Bill Sienkiewicz artwork, tough not spectacular, was very well done. The feel of the artwork comes across for me. It feels like something I would read in early issues of Amazing Fantasy or Tales from the Crypt. There’s really no better way to describe it other than like that. It feels right. As the series continues, I’ve grown to really like his style of art, and the emotion that is put into that dark void in Moon Knights cowl really does make a difference. 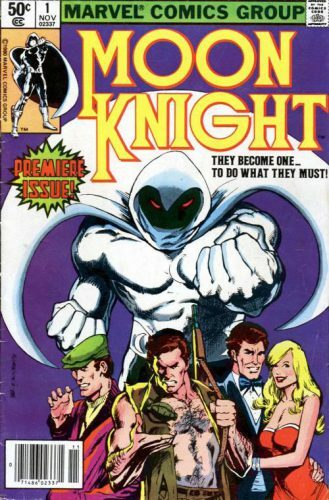 The one thing I really did not like about all of this was the four different personalities that made up Moon Knight. First off, you have Marc Spector, the gun-for-hire. Then we have Steven Grant, who’s sole purpose is to explain where all the money is coming from. Then, we get Jake Lockley, a cab driver who is right in the mix of the info on the streets. Mix all of that together, and when he puts the costume on, he becomes Moon Knight, the fourth personality. It’s confusing at times and just down right unnecessary. In later issues, it gets addressed, but then nothing more is done with it. To much focus is put on it, and I think it doesn’t even need to be there. Moon Knight is a wonderful character, and his backstory really is an interesting tale to read, however in this series its just to much all over the place. I can honestly say that I’m glad they streamlined him later on in the 90’s, and even more in the 2000’s. His current series is doing wonderfully, and it’s making an already complex character become very focused and in the frontlines where he needs to be seen. Out of the 14 issues I’ve read of the series so far, there have been only 4 or 5 that I have really liked. I can only hope it gets better as the series moves on. I too read this and thought it kind of cruddy. Sienkiewickz gets really good as the series progresses though. Most definitely! His artwork really grows as the series moves on, but the writing just stinks. I’m so dissapointed in that.